If you played and loved Neverwinter Nights or its sequel, you might want to look into Neverwinter. Making a third-person MMO instead of a third core installment was a disappointment to some but developer Cryptic Studios and publisher Perfect World have put out a solid, polished and enjoyable free-to-play MMORPG using the lore and rules of Dungeons & Dragons, even if this online-only game has nothing to do with Neverwinter Nights. 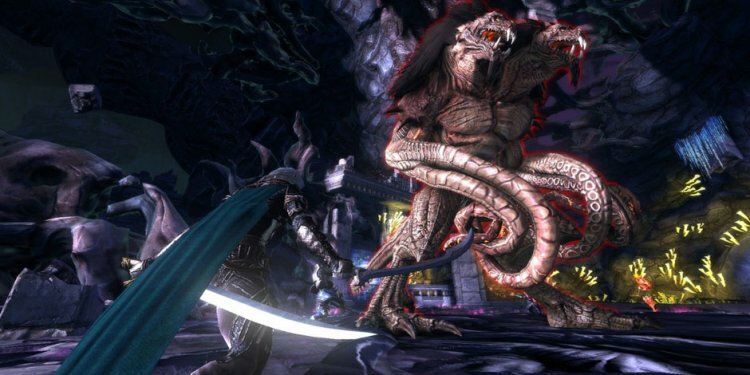 Neverwinter released last June and we played it quite a bit just before launch in the beta, and just after launch, praising the title for how it supports user-made quests and content via the Foundry system. A year and plenty of updates later and Neverwinter is getting another massive update, one of the game’s largest to date in Tyranny of Dragons. Neverwinter: Tyranny of Dragons officially launched yesterday as a free update and brings with it a new playable class of character known as the Scourge Warlock. The Warlock specializes in ranged combat and curse-based abilities and is a great support class for players enjoying Neverwinter with a group of friends and/or guild mates. The Dragons expansion also adds a new playable race as a premium (paid for) option in the form of the Dragonborn. No, this isn’t a Skyrim crossover. The Dragonborn in Neverwinter are of course actual dragon-looking people, first introduced into D&D lore in 2006 as part of the Dungeons & Dragons 3.5 edition. Character options aside, also expands the main game with new encounters, a new dungeon and a new skirmish, including new areas known as Lostmouth and Tuern, a lot of which comes from classic D&D stories. There are now regions overrun with NPCs from the Cult of the Dragon so players must take them down and battle familiar dragons from D&D lore. Rob Overmeyer, Executive Producer of Neverwinter, says it best when saying you can’t have too many dragons.